Spring training represents a few things every February and March, among them the start of the baseball season and hope for teams that have a chance to contend for a playoff spot. It also serves as an opportunity for many prospective players to make a positive impression on their organizations. This is true for players—young and old—hoping to make the roster out of camp, and for prospects and depth players, hoping to be called up later in the season. It is common knowledge among baseball fans that spring training stats aren’t generally predictive of future performance. Pitchers often enter the spring behind their positional player brethren, but even very good hitters can stumble briefly before reaching great heights. In 2018, Mookie Betts went 0-for-16 to start his spring and yet ended up claiming the American League MVP Award. Meanwhile, country music singer Garth Brooks got a hit in his third at-bat of the spring in 2004 off Mike Myers—-who would go on to help the Boston Red Sox snap their 86-year World Series drought later that the year. Brooks is not the only celebrity to see spring training action. Will Ferrell, Billy Crystal, Kevin Costner, Bruce Hornsby, Tom Selleck and even Sports Illustrated writer Tom Verducci have appeared in spring training action. Many spring training games are not on TV even in their local markets, a further indication of just how much the games count. Like Brooks’ exhibition singles with the San Diego Padres in 1999 and the Royals in 2004, anomalies do happen in preseason baseball—sometimes for an entire month. In his music career, Brooks might not be a one-hit wonder, but there have been several in spring training: players who had a scorching bat one spring training, only never to shine in the big leagues or produce at such a clip again. I looked at a few of those hitters, and attempt to identify the Kings of Spring. Jake Fox is the most notable example of this phenomena in the 21st century. The catcher/utility player never really found his spot in the big leagues. Defensively, he was a liability behind the plate; offensively, the right-handed bat with modest pop struggled mightily against southpaws. He hit .212 with a .571 OPS in 224 big league plate appearances against left-handed pitching. However, he also had one of the greatest Grapefruit League seasons on record. Although Fox too had a tremendous spring, his regular season was entirely different. With Matt Wieters behind the plate, Derrek Lee manning first base, Vladimir Guerrero as their DH, and Luke Scott in left field on Opening Day, it was tough for the Orioles to justify benching a young All-Star catcher or one of three seasoned veterans to give Fox at-bats. He never really earned them either. Two months after his glorious spring training ended on June 1, Fox was designated for assignment—and then outrighted to Triple-A Norfolk. He cleared waivers; no one wanted the Grapefruit League home run champ. After all, before being DFA’d, he’d hit .188 with a .646 OPS in 52 plate appearances and made only six starts at catcher, in part due to his sub-par defense. Although Fox would be called back up in late August, 2011 ended up being his final big league season. The man who had shown so much promise down in Sarasota ended his major league career with a -1.0 WAR in 193 games over parts of four seasons. The same year Fox raked in the Grapefruit League, the Cactus League had its own unlikely superstar: Kila Ka’aihue. Although the 2011 Kansas City Royals season will be best remembered as the year 21-year-old first baseman Eric Hosmer, 22-year-old third baseman Mike Moustakas, and 21-year-old catcher Salvador Perez each took on starting big league roles, it was the team’s 27-year-old Hawaiian first baseman/designated hitter who shined in the spring. Ka’aihue had shown modest potential the season prior (.217 batting average, eight home runs, .702 OPS in 52 games). However, the bat he showed in spring training action prior to the 2011 regular season earned him a spot in the Opening Day lineup, as Billy Butler shifted over to DH full-time. In spring, Ka’aihue did not face much competition to crack the Royals’ roster, as Hosmer had yet to play a game above Double-A, and Ka’aihue capitalized on the opportunity at hand. He mashed, hitting .397 with seven home runs and a 1.306 OPS in 22 games. All he really had to do to make the Opening Day roster was not be disastrous. Instead, he actually showed some promise of his own—although it would not last long. Hosmer, who had only 20 spring training at-bats, and Ka’aihue trended in opposite directions once the season actually began. Ka’aihue struggled against big league pitching, hitting just .195 with two home runs and a 612 OPS in 23 games before the Royals optioned him. Hosmer, on the other hand, mashed in Triple-A, hitting .439 with a .525 on-base percentage and 1.107 OPS in 26 games. On May 5, 2011, the two switched jobs; Hosmer was called up, Ka’aihue was sent down. And after 39 games with the Oakland Athletics in 2012, Ka’aihue’s big league career was over. It spanned just four seasons and featured a mere 126 games. The year after Ka’aihue and Fox mashed their way to big league roles only to never really stand out again, first baseman Matt Hague did so for the Pittsburgh Pirates, as did Chicago Cubs outfielder Joe Mather, and Seattle Mariners third baseman Alex Liddi. Hague was a .400 hitter with seven homers and a 1.200 OPS in 25 spring games for the Pirates, but the 26-year-old rookie could not help shore up a weak spot for Pittsburgh, hitting .229 with a .527 OPS in 30 games; he ended up playing only 43 games in his major league career. Meanwhile, Joe Mather’s scorching hot spring (.382 batting average, 14 extra base hits, and 1.116 OPS in 26 games) helped him earn a utility spot with the Cubs, coming off the bench to play third base and the outfield. Unlike many spring training standouts who didn’t pan out, Mather was never kicked off the Cubs roster. Instead, they kept him on their bench and he had one of the worst big league seasons in recent memory, posting a -1.2 WAR in 103 games (hitting .209 with five home runs and a .581 OPS). It would end up being his only full big league season in a four-year major league career. One year later, he was a Double-A player in the Cincinnati Reds system before he was released in June as a sub-.200 hitter. And Liddi’s .370 average, seven doubles, and 1.040 OPS in 18 spring training games never amounted to any big league success either. Although he made his team’s Opening Day roster, Liddi, who is the first major league player born in Italy in the 21st century, was never able to capitalize on his big league opportunities. Stuck behind Kyle Seager at third base, he hit .208 with six home runs and a .636 OPS in 61 games for the Mariners from 2011 to 2013 and posted a -0.6 WAR. While a few players seem to fit this bill every season, Chris Marrero seems to be the most recent example. 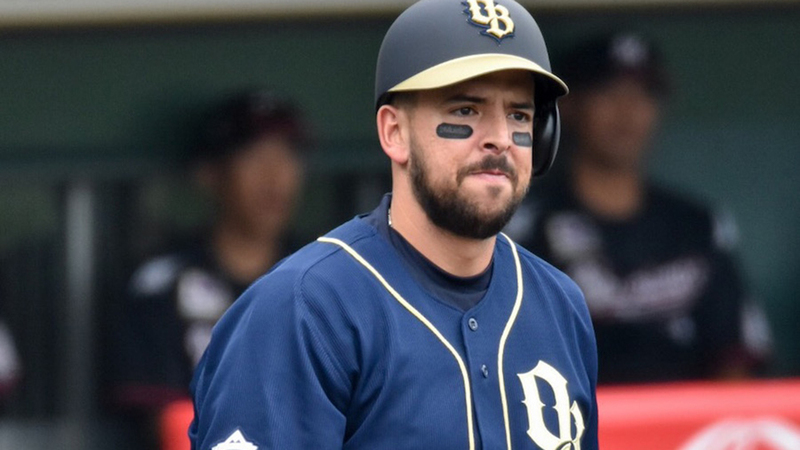 Now a member of the Orix Buffaloes of Nippon Professional Baseball, the Quad-A power hitter had one last big league hurrah in 2017 before shipping out to Japan. Marrero, the 2016 International League home run derby champ, had a chance to help the offensively anemic San Francisco Giants in 2017, and they gave him a shot after he smashed baseballs all spring, blasting seven home runs and posting a .979 OPS in 29 spring training games. 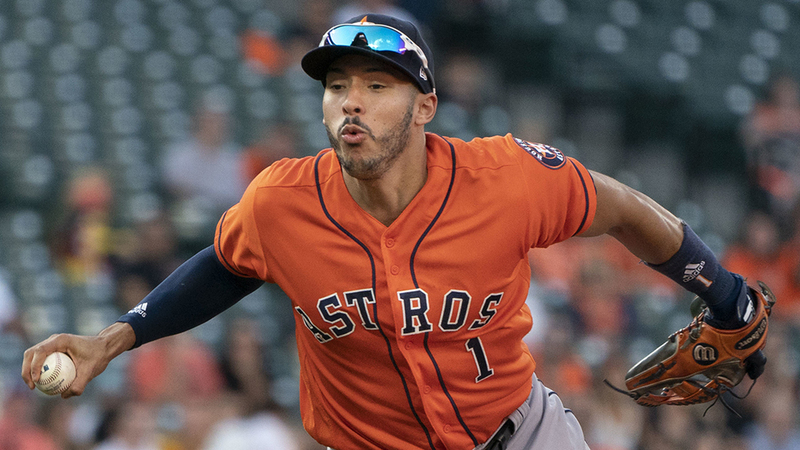 This earned him a spot in a left field platoon alongside Jarrett Parker, but when Marrero started the season by going 5-for-38 (.132 batting average), he was designated for assignment and cleared waivers. One month later, the Giants sold him to the Buffaloes. On the other hand, Seattle Mariners first baseman Dan Vogelbach still has a chance to make sure that his 2018 spring training does not go down as the highlight of his career. Sure, he hit seven home runs and had a 1.455 OPS in 22 spring games, followed by a .207 average and .691 OPS in 37 regular games last season, but he is only 26 years old, so he is not out of opportunities just yet, especially with an injury to Kyle Seager pressing Ryon Healey into service at the third base. Several factors help explain why certain players are able to have one dominant spring training despite not being big league standouts. Perhaps most obviously, the quality of pitching is not the same as it is during the regular season. The pitchers— major and minor leaguers alike—are still fine tuning their craft. Not only is the competition not always major league caliber, but the pitchers are far from being in midseason form. Routine also impacts spring training performance, as Rico Petrocelli told Boston Baseball Magazine last season. He noted that since players are not in their regular season routine, their performance can suffer. After all, the players are playing in day games, and are being subbed out of contests early; the batting orders are not what they are during the regular season, nor is the weather. Not to mention, certain players take longer to prepare for the season than others. Plus, there are players who come to spring training completely prepared—having played winter ball somewhere. The sample size is not massive, either. Usually, it only equates to around one full month of baseball, and the game’s superstars have performed far better in the regular season than even the top spring trainings on record. In June 1998, Sammy Sosa hit 20 home runs in 27 games and in March/April 2004, Barry Bonds amassed a .696 on-base percentage and a 1.828 OPS in his first 23 games of the season. Although a Fox, Ka’aihue, Marrero or the countless other spring training one-hit wonders never quite reached those monstrous figures of a Bonds or Sosa—in the regular season or spring training—they do hold a small place in baseball history. On the positive side, they helped their teams win spring training games, bringing joy to the fans who traveled south to check their teams out. Still, they are also prime examples of why spring training stats should not be taken with a grain of salt—especially for players who lack a major league track record. Tom is a freelance sportswriter based in southeastern Massachusetts who has covered professional baseball since 2013. He has written for ESPN, The Boston Globe, Newsday, USA Today, and many other outlets.